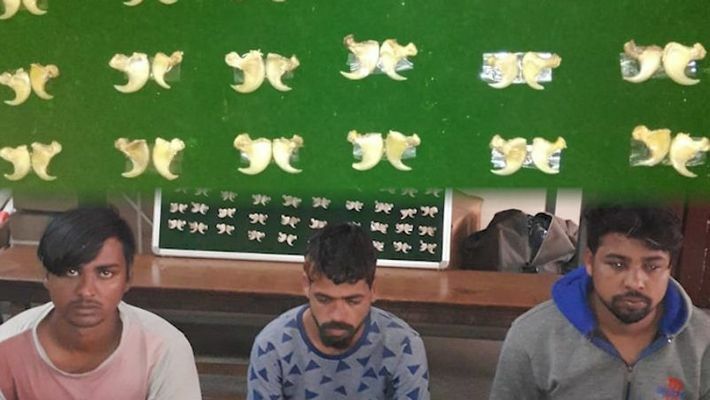 Bengaluru: Based on a tip off by the wildlife traffic network, the RMC Yard Police of Bengaluru have caught three culprits while they were trading animals' nails. Following the lead from the wildlife traffic network, the police laid a trap and posed as buyers. The accused persons were asked to come near Yeshwanthpur yard on Saturday and the police caught them red-handed with 100 nails of tigers and leopards. Two of the accused are from Nagamangala while the third is from Shikaripura, Karnataka. According to police, the fourth accused from Hunsur is still at large and a team has been formed to catch him. The police have booked the accused persons under various sections of the Wildlife Protection Act and IPC sections. The police said only an investigation will reveal whether the accused persons killed the animals to extract the nails or obtained them from naturally-found dead animals.